I’ve been a Sherlockian since I was 9 years old. My dad brought home a thick, red book with tiny text and little did I know, I was about to fall madly in love. In the pages of that book I discovered my hero, Sherlock Holmes. I devoured the entire book, The Adventures of Sherlock Holmes (which actually starts with the second story A Scandal in Bohemia) and then the rest of “the canon” (as the collection of Sherlock Holmes stories by Sir Arthur Conan Doyle are called). Ever after that, I was obsessed (as my parents can attest to). I’m not sure what exactly attracted me to Holmes at such a young age. The language was difficult, the setting foreign (Victorian and post-Victorian England), and the character was cold and distant. Perhaps it was the fact that I felt rather odd myself. The transition into a double digit age, the desire to be smart, coupled with feeling a bit like an outsider amongst my peers made reading about Sherlock Holmes a solace. 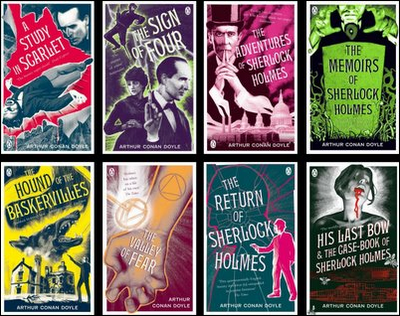 I tackled the whole series within a couple months and, for years after, books about Sherlock Holmes, copies of the stories, videos, toys, and other paraphernalia peppered the story of my life. Sherlock Holmes was always my first love. I watched every movie and TV show I could get my hands on. I even recorded episodes of my favorite cartoons that parodied the great detective. When Basil of Baker Street was rereleased I watched it with gusto. The first person I ever met who was “a friend on the internet” was Leslie Klinger when I was 16. Les went on to write the ultimate annotated Sherlock Holmes. Our trip to Minnesota one summer as a family wasn’t complete without a trip to the University of Minnesota’s Sherlock Holmes Collections. One Halloween I begged for (and helped pay for) a Sherlock Holmes costume that still hangs in my closet (I wore it about six Halloweens after that). But, my love of Sherlock Holmes did not stop there. Shortly after reading through the canon I realized there was a whole scholarly aspect to the stories. The Baker Street Irregulars, a society for serious minded study, was formed in the 1930s and counted SciFi legend Isaac Asimov among it’s members. There were journals, newsletters, and papers from all corners of the globe. When I was 11 and 12 I wrote extensively myself and submitted to some of those publications and even began my own email newsletter via my newly minted AOL account – Sherlockian Snippets. In undergrad I squeezed Sherlock Holmes into every paper I could (I even wrote a sociology paper on the Sherlock Holmes fandom). Recently, Stephen Moffat, who I’ve admired for years for his work on Doctor Who, has made the great detective famous again with his modern Sherlock for the BBC. Sherlock Holmes has also hit the pulp hero status with Guy Davis’ Sherlock Holmes. I myself am working on a novel that has touches of Sherlock Holmes. It’s been a couple years since I’ve read through the canon and I thought now would be a great time to brush off the series and read it again. I’ll be blogging my way through the read through (for those ubernerds, I’ll be doing it according to publication date, not chronologically) and you’re invited to read along and share your own insights (fair warning “A Study in Scarlet,” the first story is actually a novella so it’s a bit long). Come blog people, the game is most definitely afoot!